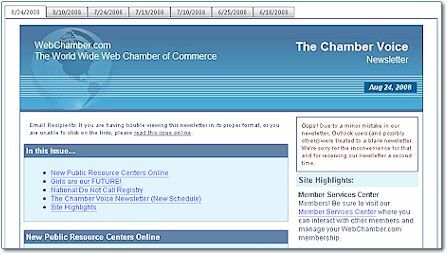 Users have access to the current version of the newsletter, as well as archived issues in a tabbed interface. 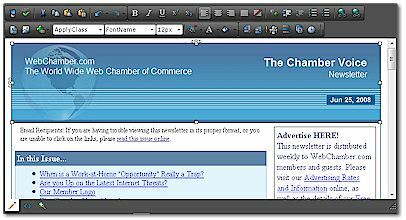 A full WYSIWYG (what-you-see-is-what-you-get) rich text editor, complete with image and template management, allows for editing very professional newsletter layouts. Auto-Save means if you unexpectedly lose connection, you won't lost your updates. Administrative functions include not only editing, but publishing and distributing newsletters via Email as well. Newsletters are distributed via email in a manner that throttles the activity so as to manage the resulting load. An administrator can also send a test distribution to a single email address to confirm how it will look when received.